Join us this week as we welcome the rock band, Freeway Revival. 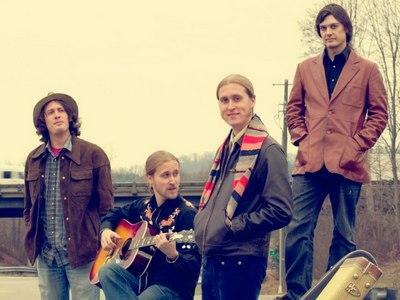 Hailing from Culpeper, Va., The Freeway Revival is a band that was forged on the road. A very extensive schedule of touring has built a band that has developed an archive of original material as well as a strong chemistry and stage presence. At the first listen to The Freeway Revival's classic rock, blues, country, and jazz blend, the ears are reminded of a time when music was about things that people could understand and relate to as well as enjoy. The music from a generation ago is reborn and performed with the same passion and feeling that left such a definite mark on the hearts and souls of the past. Having played everywhere from small bars to main stages opening for bands like Kansas and Story of the Year, The Freeway Revival is a working band who has a passion for writing and performing music. We will talk with them about their upcoming schedule, get a behind the scenes look at their music, feature their latest songs and ask them to share their message for the troops. Please be sure to visit the Freeway Revival at http://www.reverbnation.com/thefreewayrevival and spread the word. Fans are welcome to call in and chat live with them during the show. If you would like to participate in the live chat during the show, you must sign up on the show site first and then log in during the show. More great music for a really great cause! And as always we will give shout outs to our deployed military listeners. Be sure to join us, Sunday May 5th 2013 at 4:00 PM EST! Our message to the troops....WE do what we do, because YOU do what you do.